Materials: sand, roses and incense. Dimensions: m 23 x 12 x h max. 2,3. The idea of transit, the passage of people and of things, is particularly pertinent to the space chosen by Maria Dompè: an abandoned industrial structure which is part of a larger building that is destined to be transformed into a large commercial space. The things found in the space, which is now used as a dumping ground, such as furniture and equipment were used by the artist in the creation of the work. 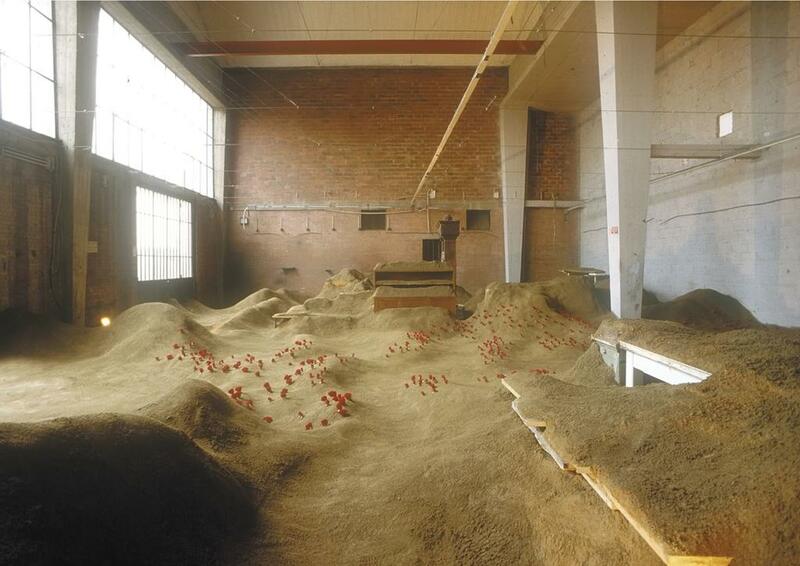 The objects were moved within this environment, and the entire space was covered by a layer of sand that invades the area, covering everything and leaving parts of the buried objects to emerge. 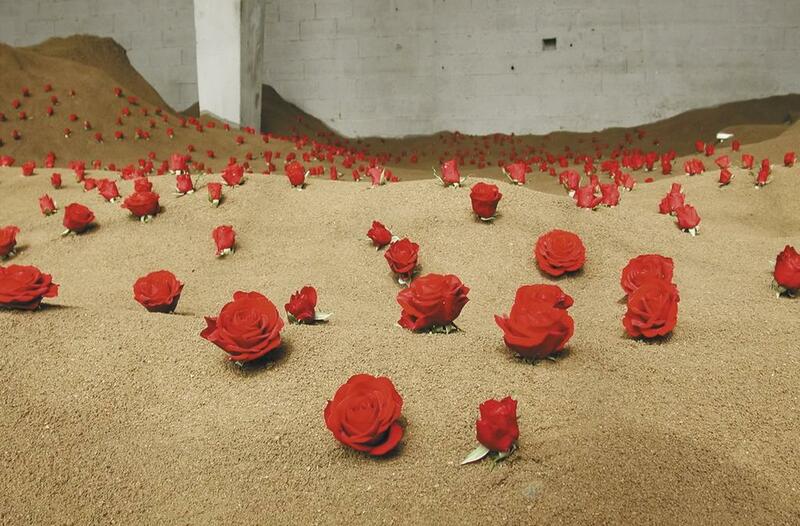 The scene transmits a sense of wadded nothingness, of emptiness, of time passed and of silence, interrupted however by the flowering of roses, the symbol of life that contradicts, even chromatically, the silent presence of the sand. The ‘area of transit’ chosen by Rosanna Tempestini Frizzi, is in the industrial zone of Osmannoro, where Chinese immigrants from the area of Florence have progressively gone to live; people who conduct an almost invisible existence, made of hard work and perhaps of an attempt to reconstruct, as a way of going beyond where they find themselves living, their own daily life marked by habit and of familiar things. This human landscape is not very different from where, in a largely Chinese neighbourhood in a suburb of Paris, Gao Xingjian lives, Nobel Prize winner for literature in 2000. 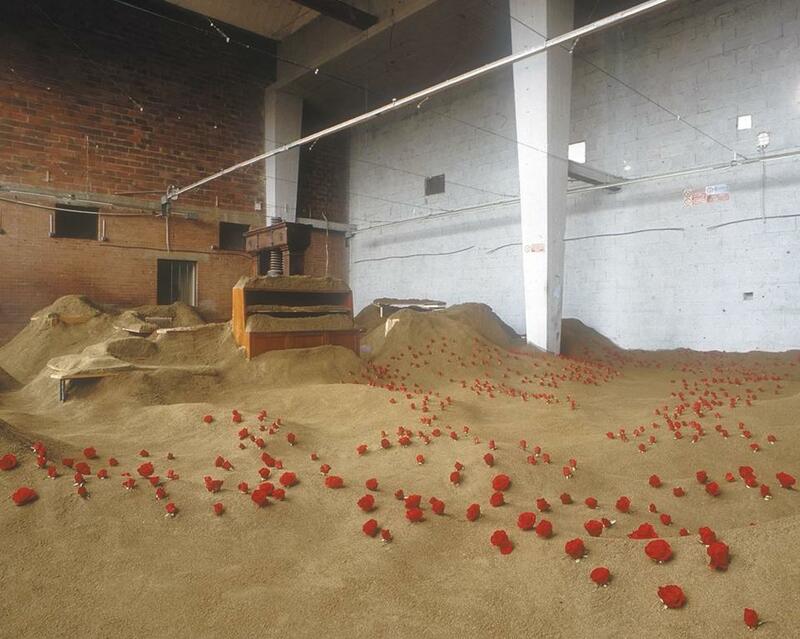 Maria Dompè wanted to dedicate to the writer this intense and poetic installation, in which the roses blossom in the sand and seem to allude to the voice of Gao Xingjiang, to the tenacity of memory which does not allow itself to be reduced to silence.